Brand new 3 bedroom, 2 bathroom furnished house in Richmond only 3.5kms from Melbourne CBD and walking distance to the MCG. 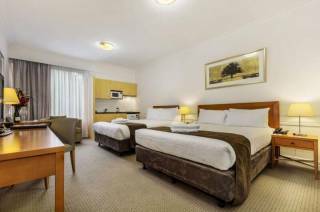 Experience quality accommodation, close to public transport and the trendy shops and cafes of Bridge Road. 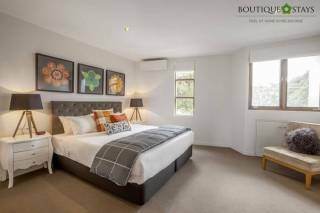 Behind its heritage facade, Victorian Vogue is a fully renovated luxury 3 bedroom and 2 bathroom fully furnished pet-friendly house in Melbourne for corporate and holiday short term rental. The three gorgeous bedrooms are split over two floors. On the top floor is the master bedroom with king bed. 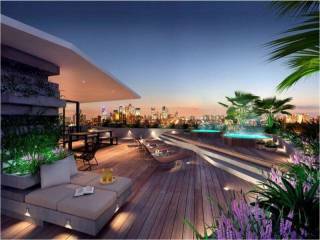 Walk through robes lead to the semi ensuite and the bedroom opens to its own private balcony. Sharing the upstairs bathroom is the second bedroom with a split king bed providing the flexibility of having it setup for you as a king or 2 singles. Both upstairs bedrooms have split system reverse cycle heating and cooling and block out blinds to ensure a comfortable nights sleep. Downstairs the third bedroom has a queen bed and hydronic heating. Flooded with light and with many fantastic features such as polished floor boards and modern gas fire, the open plan living and dining areas can comfortably seat 6 around the plasma TV or dining table. The Foxtel Platinum package is included for your viewing pleasure. Adjacent is the fully equipped entertainers kitchen with its central island benches and stainless steel oven and cook top. A seperate laundry is equipped with a combination washer and dryer and is also the powder room containing a downstairs WC. At the front of the property, the original rooms have been restored and have retained all their period charm. The front room is a spacious second living area/parents retreat or large study making it perfect for families or colleagues needing extra space. At the rear of the property is a decked courtyard with BBQ and outdoor dining. The courtyard can comfortably accommodate 1 car for off street parking and is accessed by a remote control roller door. 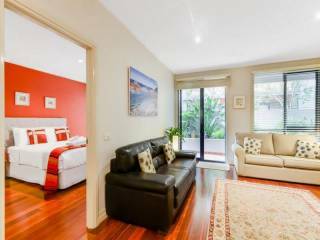 If you are looking for a 3 bedroom self catering apartment for holiday accommodation in Richmond or a furnished executive short term rental then Victorian Vogue is the perfect luxury accommodation for you. Pet guests welcome by prior arrangment. Pet Guest charges apply. 1 car park available on site plus on street parking is available.